Whether you are heading to the recording studio or the top of a mountain at sunset, our greatest desire is to protect your instruments from the conditions that cause problems in transportation. 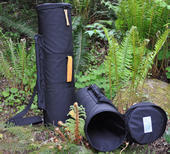 All models of the Oregon Flute Quiver are handmade of the finest materials. 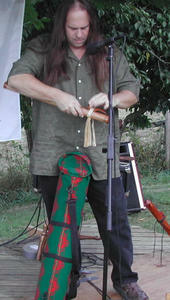 We have models to fit every Native American flute, no matter what size or length and welcome custom orders. This is the first and original hard case protection designed specifically to accommodate and protect the Native American style flute. For over 22 years Laughing Mallard flute quivers have proven to survive everything from the airlines to being dropped into the ocean. Each hard case features a lightweight, strong plastic tube fully lined to keep your flute safe. Exterior covering is tough waterproof Cordura nylon or beautiful Native American blanket print fabric woven in the USA by Pendleton Woolen Mills. The case can be carried by its deer leather handle or by its detachable nylon shoulder strap. Its foam-padded lid is sealed with a two-way nylon zipper accented with deer leather zipper pulls. Our standard length is 28” long but we can make it any length you desire. When I saw my new drone flute in E for the 1st time I was just amazed and the sound is just marvelous I have five flutes from you guys including two drone flutes and my astonishing dream flute plus a mic and two wonderful flute quivers three words sum up the Oregon Flute Store "Simply The Best!!!!" Thanks so much!! !